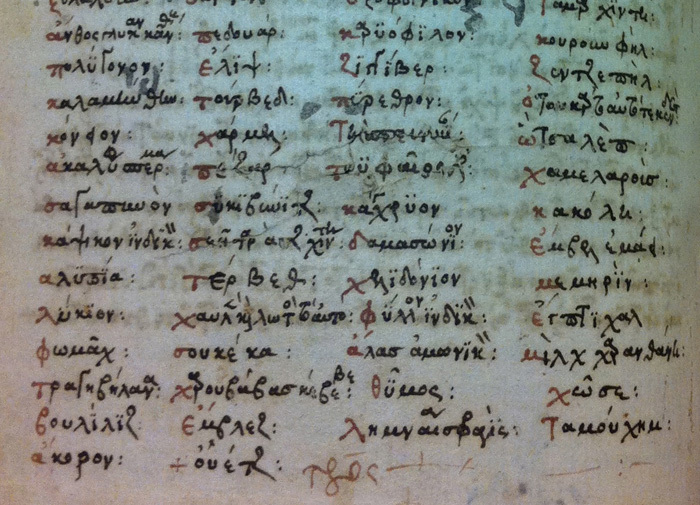 I have recently completed a new descriptive catalogue of the 16 Greek manuscripts held by the Wellcome Library. The catalogue was published in the journal Medical History with contributions from Dr Georgi R. Parpulov. Some of these manuscripts contain previously unpublished medical works (e.g. MSS. MSL. 1, 14, 52 and 60) and offer intriguing insights into medical practice in the Byzantine world. Other manuscripts have been neglected by modern scholars undertaking the textual study of Greek treatises (e.g. MSS. MSL. 62, 109, 114 and 135). This small collection thus offers great research potential. The majority of the Library’s Greek manuscripts date from the 14th to the 16th centuries, while there are a few codices from the 17th and 18th centuries that are copies of earlier manuscripts. We can divide the manuscripts into two main groups. Five codices (MSS. 289, 354, 413, 498 and 4103) were acquired separately by Sir Henry Wellcome between 1910 and 1936, while the core of the collection is made up of 11 volumes that were previously owned by the Medical Society of London (MSS. MSL. 1, 14, 52, 60, 62, 109, 112, 114, 124, 126 and 135). These latter manuscripts were among the holdings of the Medical Society of London purchased by the Wellcome Library in 1984, and were originally catalogued by Warren R. Dawson in 1932. A significant number of the Medical Society of London manuscripts earlier belonged to prominent English bibliophile physicians with a great love of Greek literature, such as Richard Mead (1673–1754), Anthony Askew (1722–74) and James Sims (1741–1820). Bilingual glossary of pharmacological plants in Greek and Arabic. MS. MSL. 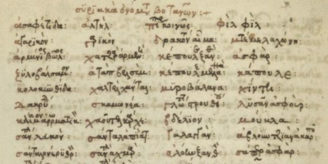 60, folio 71v. Image credit: Petros Bouras-Vallianatos. A large number of the manuscripts, 13 in number, contain medical texts. These works range in date from ancient treatises by Hippocrates and Galen to medical works composed in the Byzantine world in the Middle Ages. MS. MSL. 14, MS. MSL. 60 and MS. 4103 preserve various collections of Byzantine ‘iatrosophia’, a type of physician’s handbook, usually written in the vernacular and consisting of simple recipes for use in daily practice. This genre of Byzantine medical writing is as yet poorly studied. The recipes were reproduced several times in the centuries following the Fall of Constantinople in 1453, and were used by physicians in various Greek-speaking parts of the Balkans until the early 20th century. A case in point is the recently edited, early 20th century recipe book owned by the Cretan traditional healer Nikolaos-Konstantinos Theodorakis (1891–1979), which shows how Byzantine medical lore has survived unchanged to our own day. The most interesting manuscript of the collection is certainly MS.MSL. 60 (mid-15th century). It contains a variety of medical texts, including extremely popular ancient works such as the ‘Aphorisms’ and the ‘Prognostic’, both works of Hippocrates, plus a large number of anonymous Byzantine compilations with either a therapeutic or a diagnostic focus. From the late 11th century onwards there is evidence of the gradual enrichment of the Byzantine medical cabinet with pharmacological plants, such as galangal, zedoary and sandalwood, that originated in far off places such as the Himalayas and the island of Java. This suggests that Byzantine medicine was extremely dynamic and open to outside influence. Subsequently various bilingual glossaries, such as that shown in the image above, were produced containing Arabic terms provided in Greek transliteration alongside the corresponding Greek words. Byzantine medical authors made significant advances in the fields of diagnostics and, in particular, uroscopy. 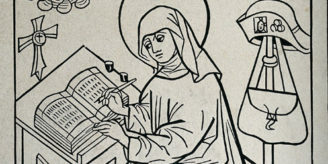 The author best represented in the Library’s collection, in MSS. MSL. 52, 112 and 124, is the late Byzantine physician John Zacharias Aktouarios (c. 1275–c. 1330). His most innovative contribution was the introduction of a special urine vial divided into 11 specific areas, which was a complete departure from the usual four-section flasks of Western medieval uroscopy treatises. John’s urine flask is illustrated in the diagram in MS. MSL. 52 shown below. In his ‘On urines’ John relates particular places in the vial to specific areas of the human body: for example, various particles found in the upper part of the vial are linked to affections of the head. Not surprisingly, by 1519 John’s work had been translated into Latin by the humanist physician Leo of Nola (1457–1525[? ]), and went through six printed editions in subsequent decades. It was not only well received by learned physicians, but became sufficiently well known to show up in 16th century vernacular texts, such as the ‘Urinal of physick’ by the Welsh physician Robert Recorde (c. 1512–58), which were aimed at a broader medical audience. 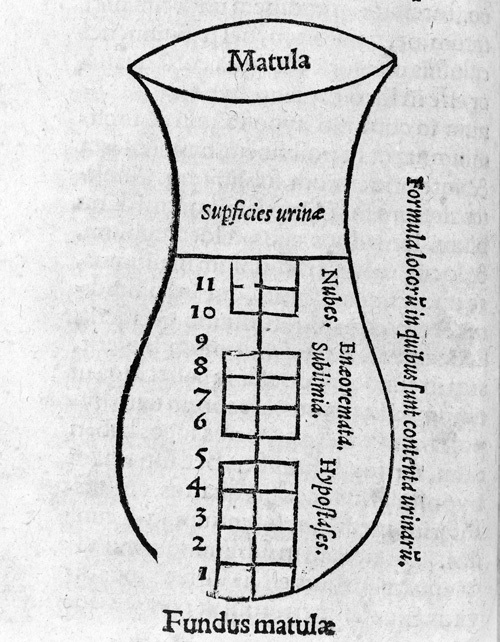 John Zacharias Aktouarios’ urine vial as conceived by Leo of Nola in the 1529 edition of his Latin translation of Aktouarios’ work. EPB/26/A: De urinis Actuarii Ioannis Zachariae filii, medici praesantissimi, libri vii (Basel: Andreas Cratander, 1529), page 40. Wellcome Images L0012935. Lastly, MS. MSL. 114 , which is the earliest manuscript of the collection, dated to c. 1335–45, presents a copy of the medical handbook of Paul of Aegina (c. 625–c. 690 AD), which has so far been overlooked by modern scholars. Paul’s work was translated into Arabic and Latin, and had a considerable reception. The English physician Francis Adams published a vast translation and commentary on Paul’s medical handbook in three volumes in 1844. Physicians who read this translation in the 19th century must have been impressed by Paul’s detailed descriptions of operations for varicose veins and various types of hernias. To sum up, by cataloguing this interesting collection I had the privilege of accessing a previously very little studied group of manuscripts. I hope that the new set of data I have provided will promote and encourage further research on the Greek manuscripts at the Wellcome Library, and that it will result in editions of as yet unpublished medical treatises. * Please note that the new catalogue of Greek manuscripts has not yet been integrated into the Wellcome Library’s online catalogue. The Library has begun digitising its pre-1500 Western European manuscripts, and is digitising most of its Greek manuscripts (pre- and post-1500). Author: Dr Petros Bouras-Vallianatos was recently awarded his PhD from King’s College London on the medical works of the late Byzantine physician John Zacharias Aktouarios. He is currently teaching medical history at the Department of History, King’s College London. His publications include several articles and book chapters on Byzantine and early Renaissance medicine and pharmacology. He is also co-editing the Brill ‘Companion to the Reception of Galen’.